No matter where you are in the office, you can deploy multiple Multy nodes throughout your environment providing even greater wireless coverage! Create up to three WiFi networks with secured traffic separation through our web browser management tool without exposing your own data privacy. Keep your company's network secure by offering a complete segregated visitor WiFi. Rapid universal wall-plate deployments The ZyXEL NWA5301-NJ has the best-of-breed deployment feasibility. 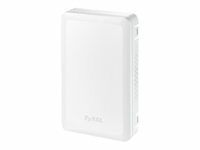 Compliant with the most commonly used outlet box standards, the ZyXEL NWA5301-NJ can be mounted with the majority of outlet boxes to provide high-quality in-room Wi-Fi coverage. An exquisite mounting plate is attached to the NWA5301-NJ for fast installation while the strong mechanism also prevents easy theft. The NWA5301-NJ also comes with Ethernet punch-down interfaces that facilitate speedy device fitting to minimize business downtime. Superb mobile-optimized RF performance The NWA5301-NJ adopts 802.11n technology to provide bandwidths of up to 300 Mbps. The implemented premium 11n features, including transmit beam-forming and maximum likelihood, allows the NWA5301-NJ to eliminate dead spots in its coverage for the best network efficiency. In hotel environments today, most users use mobile devices to access the network. As the devices have lower signal power by nature to sustain longer battery life, APs are less likely to pick up data sent from the devices comparing to which from laptops. The NWA5301-NJ comes equipped with well-placed high-gain antenna to maximize the RF pattern for optimized performance communicating with mobile devices. With all the advanced RF design, the NWA5301-NJ can significantly reduce complaints and increase satisfaction from customers. Extending modern in-room services with a box Nowadays, hotel owners provide guests with a range of services including phone, IPTV and network for home-like comfort. For this purpose, each room would require several cables or a switch; both could not only need more investment but also a longer construction period that inevitably affects the hotel business. More than just a Wi-Fi AP serving high-speed networks, the ZyXEL NWA5301-NJ has an additional PoE port, a RJ-48 phone pass-through port and one GbE port for deploying other services in the room. Using the PoE port and the phone pass-through port, analog or digital phones can be connected to the NWA5301-NJ without additional power outlet or cabling. The additional GbE Ethernet port can provide connectivity to any IP devices such as IP-TV, fax machines, printers or desktop PC. Comfortable and considerate network services With experience and expertise in the hospitality industry for years, ZyXEL implemented several thoughtful designs in NWA5301-NJ. The LED of NWA5301-NJ features a so-called "suppress mode" which stops blinking after system initialization is done; this gives the room guest a comfortable space with peaceof-mind. To prevent leaking of personal data, layer-2 isolation can be enabled in NWA5301-NJ so the users can only access shared services and peripherals such as hotel fax machines and are blocked from reaching other guest devices in the hotel. All these superior designs of ZyXEL NWA5301-NJ help hotel businesses to provide integrated in-room services with quick, best-in-class installation and to facilitate deployment and management. The Zyxel VMG1312-B10D features optional 3G connectivity as a failover (or alternative) connection to mobile broadband networks in case of DSL outage. Internet traffics will be temporarily routed through the 3G dongle plugged into the USB port; all traffics will be switched back as soon as the regular broadband service becomes available again. It is also efficient to have instant Internet access in remote offices, activities outside of the office or occasions where DSL service is temporarily unavailable. For comprehensive dongle compatibility, users can simply check and download the respective patch file to enable mobile broadband services immediately without upgrading the entire firmware of the gateway. Boost Wi-Fi coverage for more than 30% Today, speed is no longer an issue for Wi-Fi, but coverage still is. That is, longer distance causes serious drop in throughput. The boosted output power of ZyXEL NWA1100-NH improves throughput in the same distance and thus extends the coverage comparing other APs with regular output strength. With even the same number of AP deployed, users can still enjoy better performance within the coverage. Adaptive to the existing wiring infrastructure Compliant with the 802.3af standard consuming power of less than 15 Watts, the NWA1100-NH not only saves energy but also adopts latency switches; as such there's no need to change the wired infrastructure and it helps businesses to minimize extra cost on new equipment setup. ZyXEL ONE Network experience Aiming for relieving the customers from repetitive operations of deploying andmanaging a network, ZyXEL ONE Network is designed to simplify the configuration, management, and troubleshooting, allowing the customers to focus on the business priorities. ZyXEL ONE Network presents an easy-to-use tool, ZyXEL ONE Network Utility (ZON Utility), to realize speed network setup. ZyXEL Smart Connect allows ZyXEL networking equipment to be aware and recognize each other and further facilitating the network maintenance via one-click remote functions such as factory reset or power cycling. ZyXEL ONE Network redefines the network integration across multiple networking products from switch to Wi-Fi AP and to Gateway. 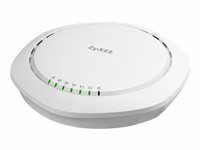 Zyxel delivers speed and convenience with its refreshed NWA1123-ACv2 802.11ac 2x2 PoE access point (AP), offering streamlined controller-less deployment for a trouble-free wireless LAN experience. Building on the solid reputation of its predecessor, this ultra-fast AP brings together remarkable performance and coverage enhancements, along with a userfriendly interface and robust design components. The smoke detector-style exterior makes this AP ideal for indoor ceiling-mount installation, providing smooth Wi-Fi service without detracting from interior design aesthetics. The NWA1123-ACv2 also supports repeater operating mode, making it a flexible solution for small businesses, hotels, and school environments. 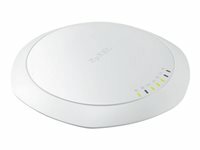 Struggling between performance and environment cohesion when deploy business wireless APs is in past. The smoke detector-style exterior of NWA1123-ACv2 is suitable for ceiling-mount that not only outperforms but also blends into the interior better as well prevents equipment theft. NWA1123-ACv2 provides repeater/root-AP mode compatibility with Zyxel Unified Pro and Unified APs, that users can extend wireless connectivity to difficult cabling locations without the bother of troublesome cabling. Also, as an ideal solution, NWA1123-ACv2 offers an array of practical features like multiple SSID, solid Wi-Fi security. The refreshed NWA1123-ACv2 features streamline controller-less deployment. Out of the box and finish three steps configuration with ZAC than NWA1123-ACv2 capable of operating autonomously without extra computer or special management tool as well as allowing administrator easy monitor via any SNMP tool in hand, even not a networking expert can handle it easily. The Zyxel VMG1312-B Series features optional 3G connectivity as a failover (or alternative) connection to 3G mobile broadband networks in case of DSL outage; with which Internet traffics will be temporarily routed through the user’s 3G dongle plugged into the USB port. All traffics will be switched back as soon as the regular broadband service becomes available again. It is also efficient to have instant Internet access in remote offices, activities outside of the offices or for occasions where DSL service is temporarily unavailable. The VMG1312-B Series works with most 3G dongles from mobile broadband SPs thanks to the latest 3G compatibility list and frequently revised patch file on the global Web site. Users can simply check and download the patch file to enable mobile broadband services immediately without upgrading the entire firmware of the gateway. 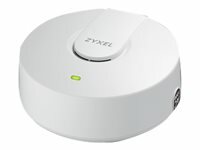 The Zyxel NWA1123-AC HD 802.11ac Wave 2 hybrid access point supports a combined data rate of up to 1.6Gbps. With Zyxel's innovative design and commitment to "RF First" for high performance and reliable connections through design, the NWA1123-AC HD delivers increased coverage and improved connection speeds for every client. The WAC6103D-I is a high-performance 802.11ac three-stream access point offering combined data transfer rates up to 1.75Gbps with a dual-optimized antenna. The adjustable antenna provides superior performance in both ceiling- and wall-mounted deployments. User-friendly features allow for adjustment of antenna patterns via either physical switch or GUI in just seconds. No prior professional knowledge of antenna accessory selection or signal coverage fine-tuning is necessary. The WAC6103D-I expresses stylish functionality through its optimized radiating platform, delivering exceptional performance in only 1.26 inches height (32mm). The WAC6103D-I perfectly blends into any modern office, hotel, classroom, or café. Designed with dual-optimized antenna, the WAC6103D-I provides switchable signal patterns to reduce inter-floor interference. In addition, advanced Wi-Fi features such as load balancing and smart-client steering ensure a smooth, consistent, and uninterrupted wireless access experience for all users. WAC6103D-I is extraordinarily easy to install with the ZyXEL APFlex™ feature. While deploying large groups of WAC6103D-I with AP controllers in place, APFlex™ enables streamline and hassle-free installation, simple switching between Managed/Standalone AP modes and automatic integration of APs into the network environment. When operating, DCS (dynamic channel selection) balances the AP channels to reduce signal interference. In the Gigabit era in Wi-Fi connectivity, upgrading to the 802.11ac standard represents the next step in wireless evolution. Many enterprises looking to break the 1-Gbps Wi-Fi speed barrier face the challenge of replacing existing 802.11n access points. While 802.11n operates on both 2.4 GHz and 5 GHz frequency band, 802.11ac predominantly uses the 5 GHz band which by its nature traditionally reduces coverage when compared to 2.4 GHz. This led to costly and time consuming efforts for installers to ensure that sufficient APs were installed to give complete coverage. ZyXEL Smart Antenna technology is a groundbreaking feature of the WAC6500 Series of wireless APs that solves the coverage problem by adaptively adjusting antenna patterns to fit a variety of wireless environments. The Smart Antenna's industry-leading RF output power and sensitivity combine to offer greater coverage and performance over traditional networks, making ZyXEL's WAC6500 Series the ultimate one-to-one AP upgrade choice. The WAC6500 series delivers industry-leading Wi-Fi performance with its innovative smart antenna design, offering more than 700 optimized signal patterns. The ZyXEL smart antenna continuously calculates the ideal physical-layer path for each individual client. This feature not only provides the best possible signal by shaping to various patterns, it also mitigates interference from other wireless clients. Many enterprises face a dilemma when migrating from 802.11n to 11ac — while 5GHz offers higher transfer speeds, its shorter wavelength can hampers coverage. The WAC6500 series’ smart antenna allows users to migrate from wireless n to wireless ac without reconfiguring or adding additional APs to a network. The smart antenna dynamically adjusts wireless patterns, doubling performance with stronger signals to increase sensitivity and improve interference resistance. Designed with smart antenna, the WAC6500 series provides dynamic signal patterns to deliver best service to every client. In addition, advanced Wi-Fi features such as load balancing and smart-client steering ensure a smooth, consistent, and uninterrupted wireless access experience for all users. WAC6500 series is extraordinarily easy to install with the ZyXEL APFlex™ feature. While deploying large groups of WAC6500 series with AP controllers in place, APFlex™ enables streamline and hassle-free installation, simple switching between Managed/Standalone AP modes and automatic integration of APs into the network environment. When operating, DCS (dynamic channel selection) balances the AP channels to reduce signal interference. ZyXEL Smart Antenna ZyXEL Smart Antenna continuously applies a unique algorithm to compute the best physical-layer path for every individual client. It not only considers best signal, but also mitigates RF interference on over 700 optimized antenna patterns. The "switch-beam" technique mitigating RF interference runs at the physical layer, requiring no effort on the part of the end-user. The adaptive antenna design handles a variety of tough deployments, including high-capacity, high-performance and interference-laden environments like conference rooms, airports, classrooms and other crowded venues. ZyXEL APFlex ZyXEL APFlex includes Zero-touch AP mode changing and Automatic IP configuration. The Zero-touch AP mode setting detects if there is an existing ZyXEL controller and chooses stand-alone or managed mode. The Automatic IP configuration removes manual configuration, allowing the AP to set itself to fixed or dynamic IP address automatically. With these two intelligent features, IT administrators can skip the two critical settings that were handled manually on legacy products, shifting focus to more critical configuration tasks. Wireless Layer-2 isolation The Layer-2 isolation protects private networks among client users, allowing users to access their shared devices without entering the rest of a private network for enhanced security. In addition, the intra-BSS blocking prevents different Wi-Fi clients associated with the same AP from seeing each other and each others data. ZyXEL One Network utility To streamline the management process, the WAC6500 Series comes with the ZyXEL One Network (ZON) utility, allowing administrators to assign IP addresses to multiple APs through just one platform. Administrators can avoid the hassle logging into each AP to change the default IP addresses before physical installation. ZyXEL AP Configurator While deploying a number of APs, repetitive configuration of each unit takes time and effort. ZyXEL AP Configurator (ZAC) builds templates that allows users to copy one profile to several APs, allowing batch firmware upgrades and profile backups in three easy steps to significantly reduce configuration time and effort. ZyXEL Wireless Optimizer ZyXEL Wireless Optimizer (ZWO) provides a powerful tool for centralized management covering initial planning, adjustment during deployment and after-sale maintenance of an AP network. Architects can simulate AP deployment on a map displaying the number of APs needed. During deployment, ZWO will also map actual signal coverage for architects to adjust their AP locations or configurations. After-sale, network administrators can access key performance details from ZWO, including channel in use, transmit retry rate and frame error rate, as well as the devices on the environment map. ZWO's user-friendly presentation saves time and facilitates quick response to the network problems. 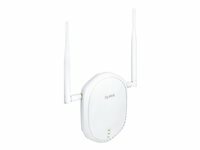 ZyMesh Wireless Mesh is an array of access points automatically forming dynamic wireless links. Built on this foundation of mesh networking, ZyMesh is ZyXEL's proprietary protocol for creating wireless mesh links for easy configuration, optimized management and enhanced reliability.